Elis and I had the opportunity to join volunteers Astrid Kant and Ronald Messemaker in the Netherlands to see first hand the problems that the Black-tailed Godwit population is facing in the Dutch hay meadows and to see what difference their efforts to protect them are making. Not a sight we see much of in the UK these days, a luxuriant hay meadow full of wild flowers. A real treat. Astrid has been working as a volunteer with the godwits for nearly 30 years and has, over that time, built up a friendly and co-operative relationship with many of the farmers in her region, what she is doing if a fine example of 'community conservation' where local people work together to solve problems on a local scale. Elis and me with Astrid (right) presenting farmer Marius with a Black-tailed Godwit pin badge (in my hand) as recognition that he is Astrid's 'star godwit farmer'. The problem that the godwits face is very simple, farming practices are changing and this has meant that the meadows in which they breed are being mown earlier and earlier. Traditionally the meadows have been cut in June which gave the birds plenty of time to lay their eggs, incubate, hatch the chicks and then to fledge the young. Now some meadows are cut at the beginning of May or even the end of April which means that the birds are losing both eggs and chicks to the machinery. Once the birds are close to fledging they are less vulnerable, so the later that meadows can be cut the better. 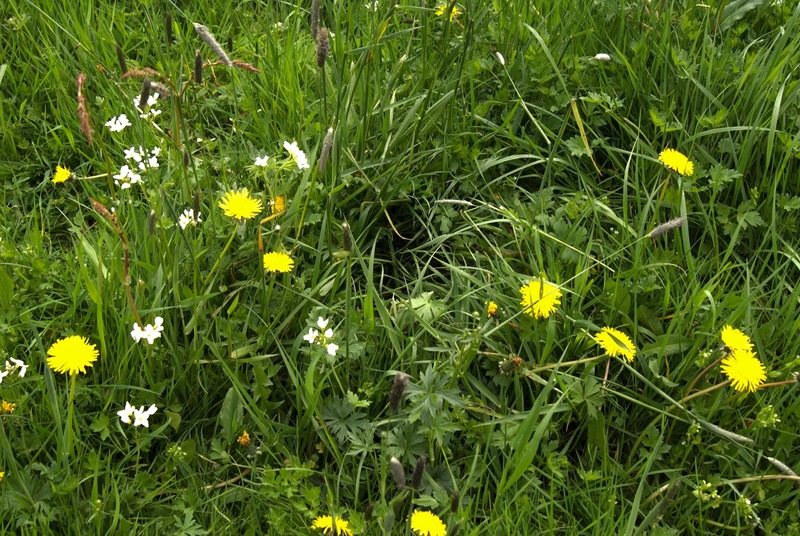 The stark difference between cut and uncut meadows; it is easy to see why chicks that survive the mowing are so much more vulnerable to predation after cutting has finished making un-cut chick meadows so important for their continued survival. With this in mind Astrid and Ronald have been talking to the farmers to get them to mow later (the farmers receive compensation for this), leave uncut 'chick meadows' (fields that are uncut to allow the young families to move to them for relative safety as in the photo above) and to mark nests so that when mowing starts the machines can leave areas around the nest untouched. Elis and Astrid marking a nest. It is not just the godwits that benefit from Astrid and Ronald's efforts, Common Reshanks, Eurasian Oystercatchers and in this case Northern Lapwing nests are all marked as well. For the most part this works well, but sometimes farmers do not understand the needs of the birds and leave the chick meadows too far from the nesting meadows for them to be useful, or do not leave sufficient uncut grass around the nests to make a difference to their survival chances. This is how not to do it. Insufficient margin has been left un-cut around the marked nest. When the cutting has finished the cut stems are tossed to help them dry quickly. In this case they were so close to the nest that the tossed grass landed on the nests causing them to be abandoned. This is a far better example, there is much more space for the birds to remain hidden and to feed after hatching. They will still have to make the perilous journey across open fields to get to the chick meadows though. Attitudes are also hard to change in some cases. 'It seems odd" Astrid says, "that we are paying these people to NOT break the law rather than punish them for doing so." Indeed it does seem strange that if you or I were to kill a godwit, it would be an arrestable offence, however apparently this does not apply to farmers, who, it appears can decide whether they adhere to this law or not. It's a bit like paying a section of our society extra, say, lorry drivers, to not break the speed limit and if they do, they go unpunished while he rest of us would receive a fine and points on our licence. Don't get me wrong, I am sure that most farmers would rather not kill the birds and many of them actively do not with Astrid's help and guidance, but there are some that just do not see the problem. Testiment to Astrid's success, an bird that she saved and ringed as a chick is now a breeding adult and has been named Ronald in honour of the assistance that Ronald himself gives Astrid in her voluntary work. We encountered one such farmer who was being compensated for saving his meadow for the botanical importance of it. This compensation was due to end and so next year he wants to seek compensation for protecting the meadow birds in the same meadow instead. He asked Astrid to search for godwit nests to prove he had some on his land so that he would be able to apply for his compensation next year, this she did and told him how many nests he had. Armed with this information he then announced that he would mow the meadow the following day godwits or no godwits as he will not be paid for that until next year. It's all about the money for some I'm afraid, it is a good job that compensation is available or none would be saved but the system is all a bit topsy turvy. This is what you are up against if you are looking for godwits' nests. They are really hard to find but are given away by the subtle 'bath plug effect' of the grass and the small number of discoloured stems (in this case just one!) that become so when the bird bends them over to provide added protection and cover when brooding. To find these nests careful observation of the birds' behaviour is necessary. Photo: Astrid Kant. During our weekend we visited some farms where the chicks have hatched and we were looking for large chicks to ring. There is no point in ringing small chicks as their survival rate is too low to make it worthwhile. The method is to visit meadows where the godwits are known to have nested and see what behaviour the adult birds are exhibiting. If the parents are flying around making their alarm calls then there are chicks in the meadow. Godwit pair flying above the meadow, their calling betraying the fact that chicks are present. It is then just a question of remaining in the car so the birds can settle and watching the field on the look out for chicks. In some of the un-mown meadows this is rather hard as the grass is so long, however the birds prefer more loosely growing parts to feed and then they are more visible. In un-cut meadows the chicks are impossible to find. This adult indicates where the chicks are, we could even hear them, but finding them would be an impossible task. This is a female. When the chicks are around they take on the role of supervising the chicks while the male (see photo below) plays his part by keeping watch from a nearby post. Adult males keep watch over the meadow where their young are being looked after by the female. Once a chick has been sited one of the crew, usually Astrid, will shoot out of the car and run hell for leather towards it while the other, usually Ronald, will watch the bird and give directions to the runner via a walkie-talkie. Often the bird will hide and then it becomes very hard to find, but sometimes the team get lucky and catch the bird which is then taken to the car for colour ringing. Astrid triumphantly returns to the car with a chick for ringing. The chicks sit quietly while they are ringed, measured and weighed. Once the bird has been ringed it is returned to where it was captured and released. Elis releasing a newly ringed chick in exactly the same spot that it was caught. During our two days three chicks were caught and ringed and we met many of the charming and friendly farmers who are co-operating with Astrid. Ronald, Elis and Astrid search for two chicks that were sighted from the car. In the end they found only one of them. It is amazing how these birds simply disappear into thin air. Since returning we have learned that Astrid has accompanied two farmers who were mowing their fields in order to save as many chicks as she could, one of whom is the farmer seeking compensation next year. In the process she saved seven godwit chicks, ringed two of them, another was already ringed (by her) and one swam across a ditch and got away. She also saved two redshank chicks and found a late godwit nest from the tractor at dusk and all of that after a full day at work. She retired to her bed that evening tired but satisfied with her efforts. We were presented with one of Astrid's stunning Black-tailed Godwit portraits of an adult with a chick.